See? a person should always save their thread! What a perfect match for my little QuiltForKids project. 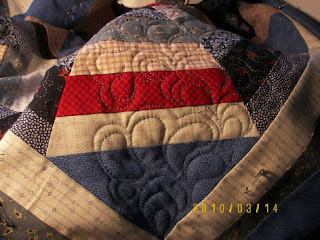 My crooked neck, sore shoulder didn't get any worse after making and quilting and finishing the little QuiltForKids project so I dragged out this QOV, that has been lanquishing in a pile with other unquilted tops. What is there about threads sewn along a curved line that is so appealing? You see, I'm just starting - this particular pattern is one I do well, but gets lost on a busy top. In some areas it's almost invisible, and then it is ME who gets lost. Still, I feel so much happier now that I can sew again. What color thread did you use on the red/white/blue? 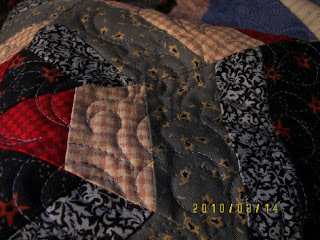 I did a bit of machine quilting this weekend, too. Got a wallhanging quilted. Glad your aches and pains seem to be going away. Happy quilting! what's that song--"back in the saddle, again!" Woohoo--sewing is back and spring is coming! Great work! I hope I get my mojo working again soon. 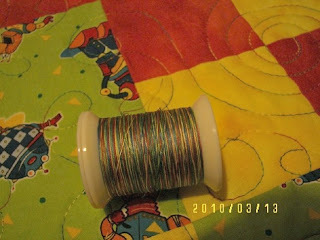 Very cute I used the same thread on my quilt for them. Glad you got to sew! Ahh, I'm delighted I stopped in today of all days! Beautiful quilt, beautiful quilting and a great day to celebrate the feeling of wellness! Happy for you and with you my friend. Warmly and with much joy! *karendianne.